Ok, not all the time. But I have been emailed on multiple occasions to be told that I have chosen the wrong word for my book blog title. 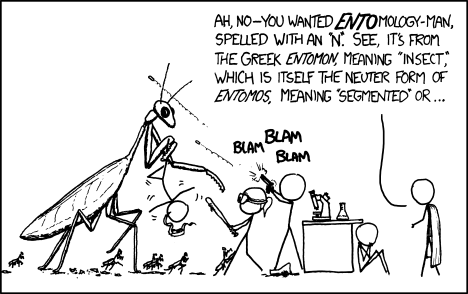 Since it's about books, not bugs, I clearly meant "etymology," not "entomology." Because one is the study of words, and the other the study of bugs. And here I thought I was being clever. Ah, well. You should just respond to those people by pointing out the rest of the blog title is "BookWORM". I think you're too clever for some people. Thanks! Sometimes I think maybe everyone else is clever and I just think I am, which is why they don't get it? Hahahahahahahaha. I actually make this mistake constantly (not about your blog though! I got the joke! ), so I loved this cartoon. Really? I totally thought you were being clever! I immediately thought of your blog when I saw this a few days ago...! And yes, I agree with everyone, you're clearly too clever for us all.